Gluten Free Salted Peanut Butter Cookies – Made with just a few ingredients, these Peanut Butter Cookies are fudgy, sweet & salty, gluten free and naturally sweetened! Hello, World!! It’s Friday! Make some noise!! Althooooough, according to Mr. Google’s Analytics, I see 1 girl from Johannesburg and 2 boys from Russia dialing in. Um. Dialing in? What is this? 1992?? Speaking of 1992. I HATED Peanut Butter back in 1992. It took me like 16.4 years to finally give in. I was more about the Erokrem, known better as Nutella around these parts. Then, a few years later, something happened. Actually, college happened. College was about being forever broke and eating cheap. Cheap, as in scrambled eggs for lunch AND dinner, and Peanut Butter for dessert. The times that I DID have some money laying around (how does money just lay around? ), I spent it on partying. Err. I mean notebooks! You should also know that I learned how to make cookies in college. Cookies on the cheap. A.K.A. Betty Crocker’s Cookie-Mix. Buuuut, I really WISH I had known about this Gluten-Free-deal way back then. I would have saved my thighs a few rubs and some carbs here and there, know what I mean? Anyway. Peanut Butter Cookies remind me of College. So… yeah. Now that I’m a grown-up (ewwwww! I hate admitting that! ), and can make cookies from scratch, I try to include Peanut Butter whenever and wherever I can. Looking through my arsenal, I was inspired to make these cookies after seeing the Samoa Peanut Butter Bars that I made few months back. (Slurrrrp….) Followed up by a few searches, this is what I came up with. Made with just 3 ingredients, maybe 5, these Peanut Butter Cookies are sweet, salty, gluten free and sugar free. BUT NOT taste-free! That’s what we’re looking for, right? It’s all about the taste, dang it! Go, have the greatest weekend ever and make them cookies! Made with just a few ingredients, these Peanut Butter Cookies are fudgy, sweet & salty, gluten free and naturally sweetened. 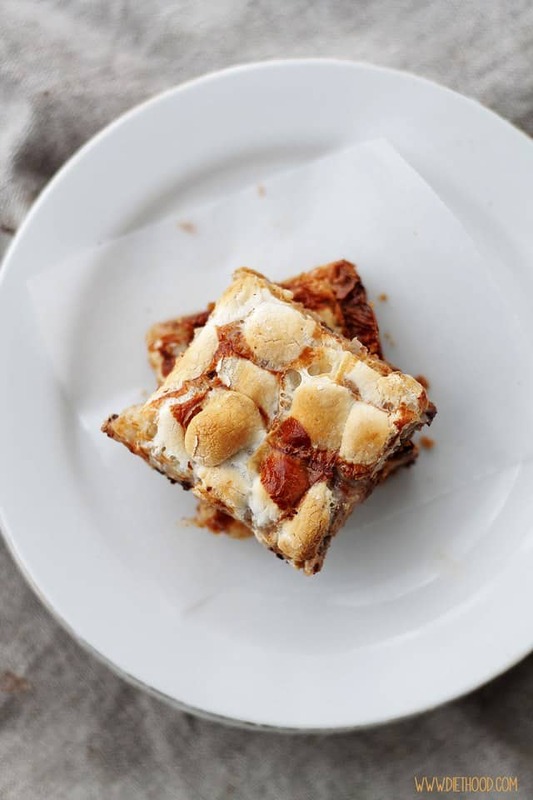 You can also use 3 tablespoons of just honey or just molasses. In a small mixing bowl, combine peanut butter, egg, honey and molasses; whisk until completely incorporated and smooth. Place bowl in the fridge for 10 minutes. Line a baking sheet with parchment paper; place in freezer for 5 minutes. Remove peanut butter mixture from fridge and baking sheet from freezer. 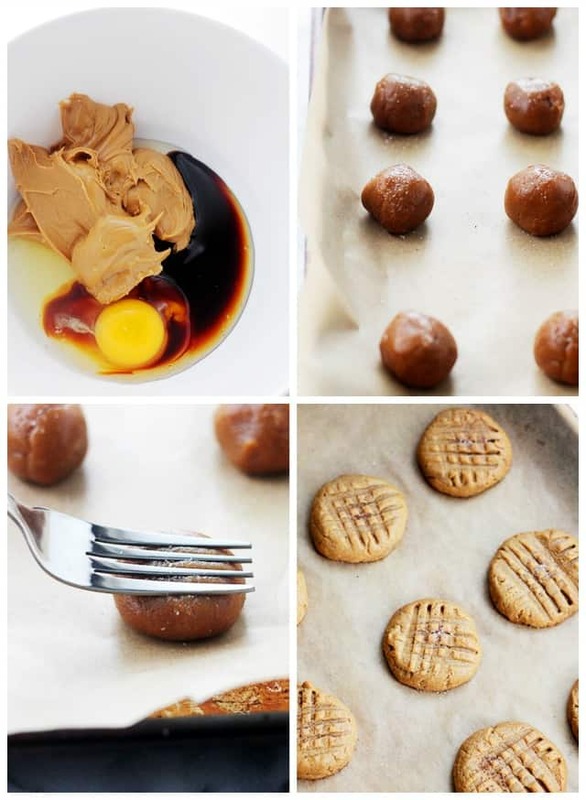 Shape peanut butter mixture into 1-inch balls. Place peanut butter balls on previously prepared baking sheet. Slightly flatten each ball with a fork, making a cross pattern on the cookies. Bake for 8 to 9 minutes, or until slightly browned on the bottom. Remove from oven; let stand on baking sheet for two minutes. Transfer to wire racks and let cool completely. I have to admit I don’t normally leave reviews, but I saw this receipt got some low stars so I just had to add my 2 cents.!!!! I used to bake these cookies ALL the time, and then got away from them, and recently have been on the search for the recipe again as I want to eat healthier (once again!). Luckily i found it. Surprised so many have issues with this recipe. I find this recipe super easy and so delish!!!! 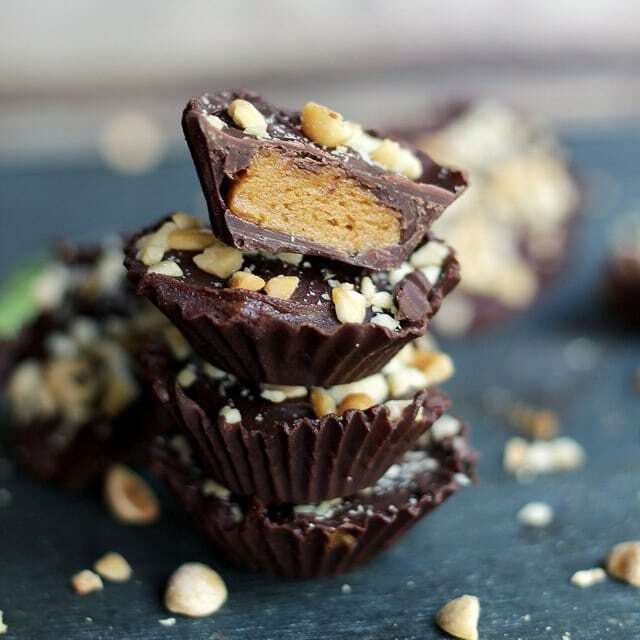 if you love peanut butter you will love these little gems. All natural ingredients, I use natural peanut butter that you would find at your local bulk barn. mmm they look delicious, what kind of honey do you use? I made these as the recipe says. I didn’t like them at all. They were too dense and not that good flavoured. Oh well, it was worth a try. It could be the brand of peanut butter. I used a no-name brand from Walmart. It’s not that great. I’ma make these right away. Trivia: money doesn’t just lay around. It LIES around. More trivia: if you use black-strap molasses, which is the third boil, you get the highest concentration of nutrients, including copper. SOME say copper is the missing ingredient in melanocytes that makes your hair turn GRAY! I’m 62 and my wife says I have 20 gray hairs. I get my copper. Thanks for this recipe. Beautiful peanut butter cookies, Kate! These are very close to my paleo SunButter cookies and I can’t wait to try your recipe with the peanut butter you recommended. I love Smuckers peanut butter, jams and preserves. Thanks for sharing. Yum! Oh No :(( What do you think went wrong?? Do you think maybe the honey was too thin? Or even the peanut butter? 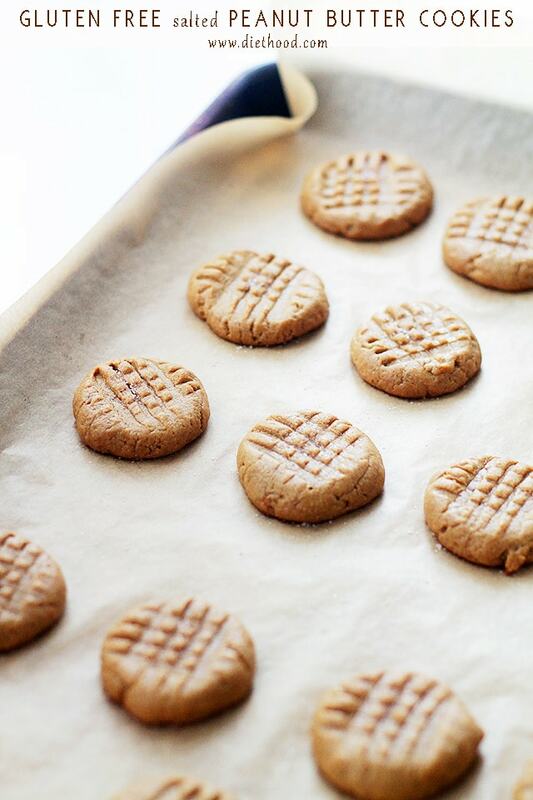 Vegan Peanut Butter Cookies | laugh.live.love.learn. 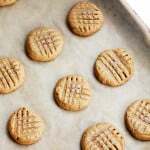 Now that’s a pretty cookie and peanut butter is always a crowd pleaser! Yes! Cookies like this are so easy to make… and so super delicious! 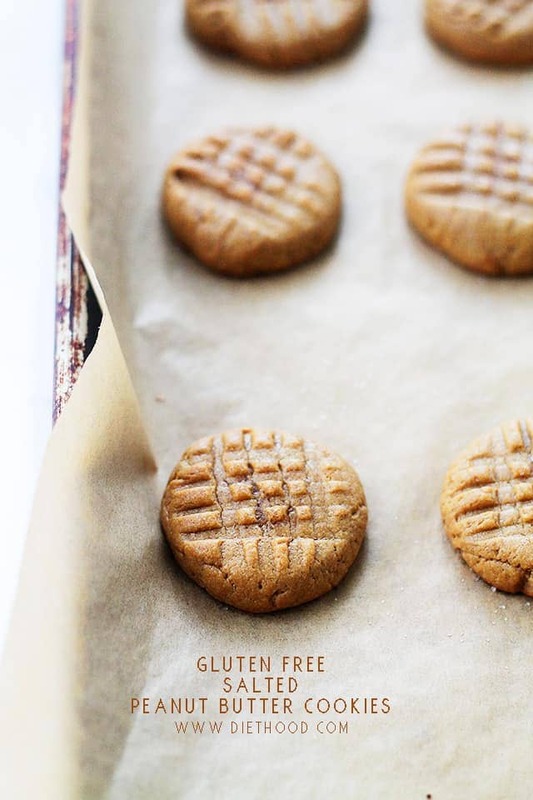 I love how easy it is to make gluten-free peanut butter cookies! And they come out so well. Gorgeous cookies, love the honey and molasses in these beauties! These cookies look like they just walked out of a bakery. They are perfect and gluten free? My uncle would love these. I love flourless pb cookies. They are so good and peanut buttery. No pb cookie I’d rather eat! I love love that you added molasses to these cookies! I could drink molasses with a straw! Pinning! 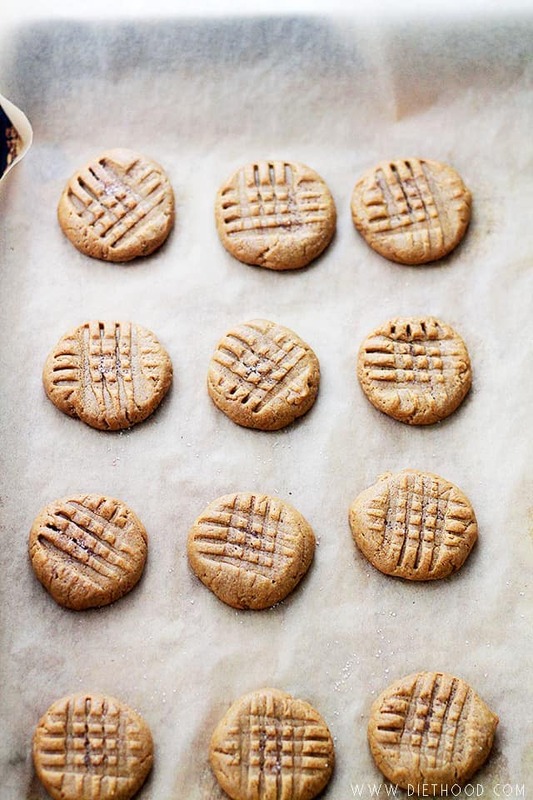 I’ve made more than my share of flourless PB cookies but never with honey and molasses – love them both! GREAT idea! Pinned!